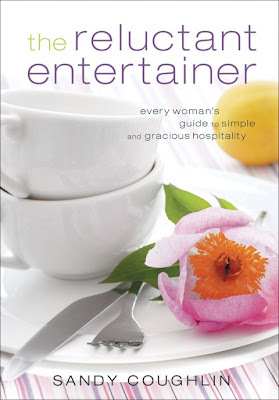 Amanda from Serenity Now posted about her Independence Day party and mentioned a fabulous book by Sandy Coughlin called The Reluctant Entertainer. This book focuses on the hospitality part of get-togethers. I seldom focus on hospitality. I'm too busy worrying whether or not the pop is perfectly chilled, whether someone has waited too long for their drink, whether the small stain in the left corner of the tablecloth is noticeable, or whether the dog has yet drooled on anybody to be hospitable. Instead I run around near frantically, yelling at dogs and hubby, trying to whip everyone into shape. Come on people, this is a soiree, let's get it together dammit. I know, it sounds completely ludicrous here, but that's what I do. And of course, I don't end up enjoying anything. I mean I love having family and friends over, but I don't actually get to have much of a conversation with anyone, certainly nothing meaningful. I barely get to snap a few pictures of my nephew (to be fair, he moves pretty quickly, but still). So I thought I would try out The Reluctant Entertainer and see if there were any words of wisdom that might help me with my problem. Well of course there were. Mostly stuff we all know already,...people aren't there to see your house or your stuff or how well you cleaned,...they just want to be in your company. She does offer some more concrete assistance including a list of ten commandments that I found helpful: (Commandment 1 -- Hospitality is not about you. It's about making others feel warm and welcome.) She sings the praises of simplifying and suggests incorporating the five senses to make an overall pleasant experience for your guests. Most recently I was at the receiving end of supreme hospitality and simplicity. We stopped by the house of our electrician to settle our bill. I waited in the car while my husband sought him out. Within moments he discovers that I am out in the car and runs to me with paper towels and two fresh (absolutely awesome) peaches from his trees. So thoughtful, so sweet, so funny. I loved it. Made me feel special and it didn't take a lot of planning or money or preparation. Just a soul that was looking for an opportunity to be hospitable. Do you get stressed out when people are coming over? Any tips or techniques to squelch those feelings? Sandy Coughlin also has a blog called The Reluctant Entertainer that you might want to check out. Hahahahahahaha! I am THEE prep nazi. It's best if everyone just leaves the house for two days before company arrives. Enter at your own risk. Oh my. Unfortunately this is me to a tee!! I have gotten somewhat better with family I only freak out for 3 or 4 days instead of 2 weeks like I used to. But my mother-in-law decided it would be good to have my SIL's baby shower at my home and the entire month before was hell for the entire family!! :) I will for sure be getting the book and visit the blog. Thanks for sharing! Oh that used to me too. Then I decided I wanted to enjoy my own parties. I hated being stuck in the kitchen putting every thing together. So I started cooking items that didn't need any or only a small amount of last minute prep. I also started accepting help. When friends offer to serve the desert I take her up on it. One year I was serving creme brule and I asked the husband of a friend to help with the blow torch. He loved helping and wants to help every year.